Allievi Photography - Convert xmp to lrtemplate and vice versa. Convert xmp to lrtemplate and vice versa. NOTE: The Photoshop Panel is now discontinued and it has been substituted with a Java application that doesn’t require Photoshop and works under Win & Mac. Beginning with Lightroom CC 1.3 and Lightroom Classic 7.3, Adobe Lightroom imports and converts your lrtemplate files into xmp format which is compatible with Adobe Camera Raw in Adobe Photoshop. What you aren’t allowed to do is to export your newly created xmp templates back to the old lrtemplate format. If you are a template creator, chances are that you want to make your presets available to your customers in both xmp and lrtemplate format for both pre 7.3 users and 7.3 and above users. 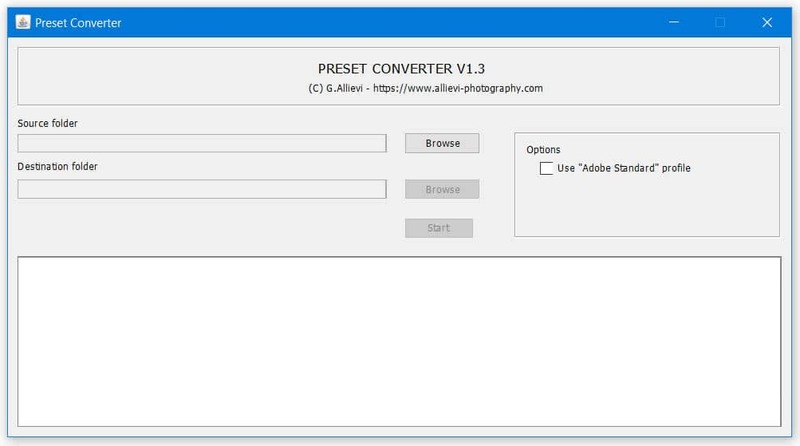 Preset converter is a tiny Java application that can convert lrtemplate presets to Adobe Camera Raw XMP presets and vice versa. Just feed it with a folder with lrtemplates (or xmp templates) and it will convert all your presets in seconds. You can find a short video showing the xmp to lrtemplate conversion here. 12.00€ – Free lifetime update! Immediate download. You will receive the download link via an email: please ensure your email is valid and that the inbox is not full.